This is a simplified description of material as applied in a custom bicycle frame. I have left many details out in an effort to keep the conversation focused and simple. If you want a more technical and detailed description of materials, you can read Scot Nicol’s “Metallurgy for Cyclists” here. First, let’s establish that we are considering a custom frame. When you buy a custom frame, the builder works back from you to the frame. This means that if you’ve never purchased a custom frame, you’ll have to change the way you think about your purchase. Instead of comparing one frame to another, you have to define your priorities. Once your priorities have been identified, choosing the material becomes a lot more obvious. One important thing to keep in mind is that we are optimizing the material properties to fit your priorities for your custom bike frame. You can’t compare the reputation of a material as it’s used in a mass produced frame with a custom application because mass produced frames haven’t been optimized to meet your unique priorities. In this discussion, we’ll consider steel, titanium, carbon fiber, and aluminum. Each one of these materials if chosen for a specific reason to meet certain priorities, and each will excel if applied correctly. It’s important to understand that each material has different mechanical properties, and each combination of properties is taken into consideration through the builder’s application of the material. The key mechanical properties the builder looks at are: modulus, tensile strength, fatigue strength, and density. Each material can be as stiff or as soft as you want when applied in a bike frame, no matter its actual modulus (stiffness). Tube diameter determines stiffness. If the material used is less stiff, the tube diameter is increased in order to achieve the same stiffness as other materials. The key to frame design is that stiffness goes up with diameter faster than it does by adding more material. To keep the tube from getting heavier due to it’s increased diameter, a thinner tube wall is used. This allows the builder to increase stiffness while keeping weight down. Of course, something has to give: in this case, it’s wall thickness. You can only go so far before the wall of the tube is so thin it will easily tear, buckle, or dent. For example, as a material, aluminum is about half as stiff as steel, but we can make an aluminum tube as stiff as a steel tube by using a much larger diameter than we would with steel. Without getting too “engineer-y”, let’s look at the practical considerations for a rider. When you buy a frame and are considering material, you have several considerations: the price, the weight, durability, and ride characteristics. Price – Price is probably the first and most obvious factor by which to compare frames. When considering price, the most important thing to remember is that you have to compare apples to apples. That means it’s not fair to compare a mass-produced frame to a frame made one at a time by a custom builder. That being said, in the realm of the handcrafted frame, steel and aluminum will typically be the least expensive, with titanium being more expensive and carbon fiber being the most expensive. Weight – As applied in a frame, the next obvious thing to compare is weight. An average size frame will weigh between 2 and 5 pounds. As weight goes down, cost goes up and/or stiffness and durability go down. All else being equal, carbon fiber will produce the lightest frame, followed by titanium and then steel. Aluminum can be very light, but it gives up a lot of durability to do so. Durability – Service life for a high-end custom frame is usually indefinite (although in some cases you may feel lightness is more important than longevity). We can further reduce weight, but it will shorten the service life. As weight goes down, durability goes down—and vice versa. Titanium and steel are the most durable, and titanium makes a lighter frame. aluminum and carbon are lighter but not as durable, so more material needs to be used for equivalent strength. Ride characteristics – This is where there is a lot of mythology in the market. While each material is somewhat different in feel, all can create a frame as compliant or stiff as the builder wants. It’s all about balance. Stiffness and compliance need to be balanced against each other, and it’s up to the builder to help figure out that balance and specify the tubes accordingly. Besides stiffness of the frame, feel is also important, but is much more subjective and esoteric. 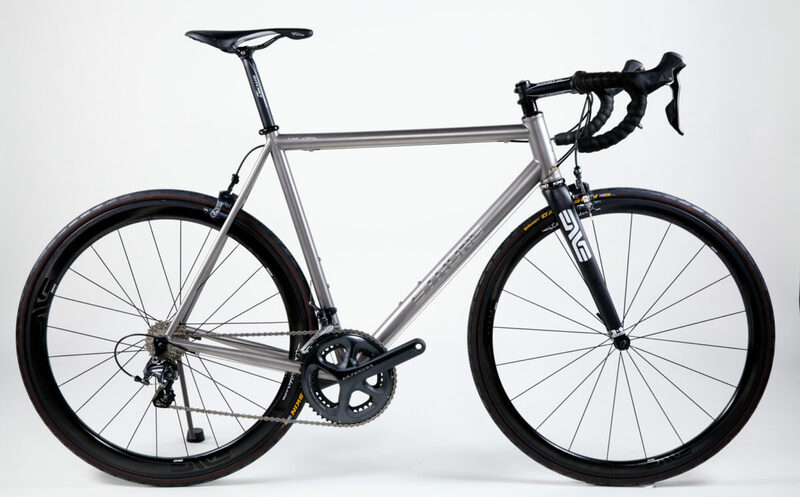 There is no best “feel”, but typically steel frames are “lively” (which is a “springy” feel), titanium shares the feel of steel but is slightly more damping and takes the edge off of the high frequency road noise, and carbon fiber has a very damp feel and little “springiness”. Finally, aluminum lacks “springiness” and damping, which is why it’s got a rap for feeling “harsh”. That’s it. When choosing frame material, take the time to evaluate your priorities. Understanding how each material may serve your priorities will tell you which material is best for you. Steel is the best balance of cost weight and durability. If you want a lighter frame, with great durability, titanium is the choice for you but you will pay a premium. Carbon fiber is perfect for the customer who wants the lightest, stiffest frame, isn’t as concerned with durability, and is willing to pay the price. Aluminum is cheap, light and stiff, but when built to be light, suffers from low durability.